Traditional Neighborhood Development (TND) is a design technique that replicates historic development patterns found in American towns and applies their basic elements to new development projects. TND designs include compact, pedestrian friendly development with a mix of land uses in a village-type setting, unlike the sprawling, conventional subdivisions that have dominated residential development since the middle of the 20th Century. Use of TND in place of a conventional subdivision reduces land consumption and preserves open space. TND can be used to develop entirely new communities, but can also be used to extend or fill-in an existing community. Existing historic structures can also be incorporated into the TND. Encourages a sense of community. Resistance from investors who may be hesitant to finance projects that do not reflect conventional or common development patterns (although this is changing as TND receives increased market approval). Evaluate Community Policy and Support: The municipality should review its comprehensive plan to determine whether the principles of TND are supported by the community. If the community supports the concept, the municipality should establish any additional policies that may be necessary to permit and promote TND, as well as support the provision of open space and village-type developments. Community Profile: The municipality should determine how the TND concept can fit within the community's character and be supported by municipal services. The municipality should determine whether any TND-type developments currently exist within the community. Is there adequate access to utilities and transportation facilities for potential TNDs? These issues should be addressed prior to moving forward with a TND ordinance. Ordinance Review: After completing the two previous steps, the municipality should evaluate its current zoning and subdivision regulations to determine how TND can be integrated into the municipality's ordinances. Conventional zoning and subdivision regulations typically do not support TND-type developments. This review should identify how existing ordinances impede the creation of smaller lots and the compact, mixed-use character of a TND. Zoning Ordinance Revisions: Flexibility and simplicity are keys to the success of TND projects. If necessary, zoning and subdivision and land development ordinances should be amended to support TND. The TND should be offered as an option within the zoning ordinance as a "by-right" land use, with specific standards for land uses, density and designs. For example, lots as small as 7,500 square feet (or smaller) should be encouraged. Standards such as "build-to" lines instead of deep yard setbacks should be included to encourage structures to be located near roadways and to define street space and a "sense of place". Special amendments may also be needed to permit mixed land uses, to allow for on-street parking, narrow streets (down to 18 feet), alleys, sidewalks and interconnected transportation facilities. "Anchor" in the center of the TND. This may feature a park, community meeting space, corner store, post office, town hall, library, transportation center, entertainment center, or another important place where people will congregate. Walkable distances. A one-quarter mile distance equates to approximately a 5 to 10 minute walk; this should represent the distance from the village core to each of its neighborhoods. Mixed land uses. TNDs combine residential areas, institutions such as schools and municipal offices or emergency service providers, employment areas, limited industrial areas, and commercial areas. First floors can contain retail land uses while residences can occupy upper floors. Parks, open spaces and countryside areas. Open spaces can help define the boundaries of the TND and separate it from adjoining areas that may include different land uses, or can be used within the TND for a public gathering space or recreation. Street network. TNDs include organized blocks and patterns of lots and alleys that allow for a flexible circulation pattern that often includes street vistas that terminate with public space or public buildings. On-street parallel parking. Parked cars provide a buffer between vehicles moving on the streets and pedestrians on sidewalks, and also create a traffic calming effect. Overflow parking areas should be located to the rear and sides of buildings, often accessed through service lanes and alleys. Garages should be located to the rear of buildings to preserve the streetscape. Shallow lot setbacks. Pedestrian activity can be accommodated best by placing structures close to the road. Building fronts should generally be not more than 60â€“80 feet across each side of the road because this encourages a human-scale design. Architectural elements. 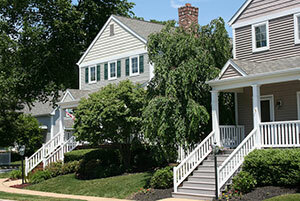 Front porches create a transitional area between the public realm of the street and private areas. They also encourage interaction between pedestrians and residents and retail areas. Sidewalks are critical to form these interactions. Fences, hedges, short walls, street furniture and lights can also help create a sense of place and define the neighborhood. Landscaping. Shade trees along roadways can provide relief from heat and sunshine and help define the street as an "outdoor room". The municipality should identify appropriate locations for potential TNDs within the zoning ordinance and zoning map. TNDs should have good access to significant roads including major highways and collector roads (although they should not directly abut such roadways). Ordinances can allow TNDs either in fixed locations or as "floating" districts that can be applied with specific circumstances can be met. The TND ordinance should establish a minimum tract area that can support the elements of a successful design. Twenty acres is often characterized as the smallest area that can support a new TND community, but local circumstances such as in-fill can allow even smaller TND tracts to be successful. The "Gardens at Eagleview" is an example of a TND in Uwchlan Township's Zoning Ordinance. Honey Brook Township's Zoning Ordinance contains a TND provision that is anchored in the Rocklyn Station neighborhood. The Pennsylvania Municipalities Planning Code, Act 247, enables municipalities to establish land use controls such as zoning and subdivision ordinances that can accommodate traditional neighborhood development patterns. Article VII-A provides the specifics for TND in the MPC. The Official Map, as provided in Article IV of the Municipalities Planning Code, can help establish the road network and infrastructure rights-of-way needed for TNDs.